Olympian Nastia Liukin and the gymnasts and instructors of the GymQuest Sports Academy. Scott Halasz | Greene County News Olympic gold medalist Nastia Liukin keeps an eye on a couple gymnasts at the GymQuest Sports Academy in Beavercreek. Liukin was in town to help out during a camp. BEAVERCREEK — Sticking the landing on a dismount is crucial in gymnastics. 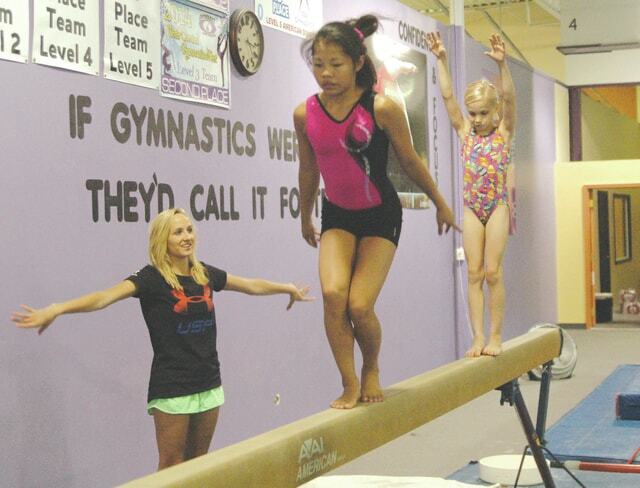 But it takes more than the ability to balance on a mat to make it to the top, and Olympic gold medalist Nastia Liukin was in Beavercreek the past few days sharing her physical and mental skills with aspiring gymnasts. The 25-year-old Texas native was a guest instructor at GymQuest Sports Academy’s gymnastics camp, working with girls looking for any and all tips on how to become better. Liukin — who won five medals in the 2008 Olympics including an all-around gold and a team silver — was more than happy to lend a hand and a few words. While she was often seen showing the kids what good balance beam form looks like — she was the 2008 silver medalist on that apparatus — she also made sure that the campers know it also takes a balanced mind to be successful. That same message will be delivered in Cincinnati and Cleveland later this summer when she makes stops there as part of her Shine Tour, which is named after The Shine Agency — a sports management business which focuses on motivation, self-esteem and confidence — which she co-founded. Liukin also stressed that ability will only get a gymnast so far. It takes more than that to be successful. The gymnasts at GymQuest heard the 14-time gold medalist loud and clear. Rebecca Wiese, 13, learned the proper placement for her arms during a twist, but also picked up on the importance of being in the right place mentally. “She taught us how to relax and not be all nervous,” Wiese said. Having decorated gymnasts in Beavercreek is nothing new. Courtney Kupets, an 18-time gold medalist and an Olympic silver medalist in 2004 was at GymQuest last year. Liukin’s 2008 teammate Chellsie Memmel — a three-time World Championships gold medalist — will be in Beavercreek the rest of the week. “I think it’s always good for these kids to experience working with somebody who went that far in the sport,” team coach Kim Busche said. The campers — especially the younger ones — agree.